The Ultima class system defense platforms are used to protect the most important systems in the United Worlds Warlock. 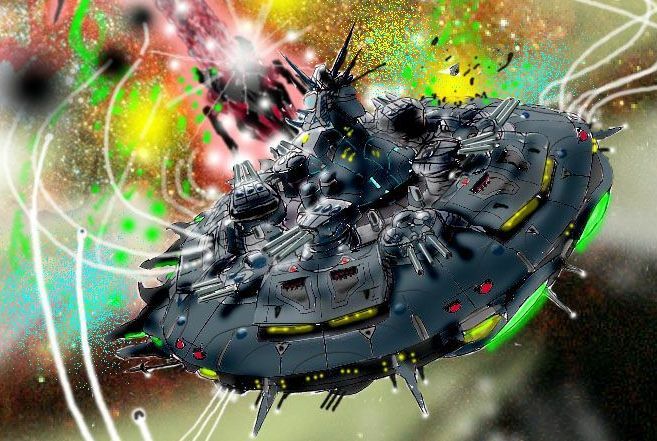 The platforms date from around the beginning of the United Worlds Warlock and are only slightly newer than the Dwarven Iron Ships which still form the bulk of mobile forces. They each pack tremendous firepower and have a huge number of fighters. In spite of their age, these huge platforms were incredibly expensive to construct and, while considered outdated by some U.W.W. Naval leaders, are considered to have been too expensive to construct in terms of resources to simply abandon. The platforms have been steadily upgraded including fighters, point defense systems, and electronics. Still, the upgrades have not kept pace with other forces. There was some consideration given to retiring the platforms but instead it was decided that the platforms would receive comprehensive upgrades. Originally, fourteen platforms were constructed but only twelve remain. Two were lost in combat and several have been badly damaged. Only three have been so far upgraded and it may be decades before all of the remaining platforms are upgraded. Most of the U.W.W. Military funds are being spent on mobile forces and many Naval leaders prefer monitors for system defense over the giant system defense platforms. Monitors are far cheaper and are far more mobile. Some naval officers even suggested the idea of reusing the weaponry on the platforms on the construction of monitors and battlecruisers. Each platform, if decommissioned, could provide enough flame cannons for four monitors or three battlecruisers. Replacing the enchanted iron plates on the defense platforms, so it was decided that the armor would be reinforced instead. Around the round body of the platform, a belt of additional armor was added and various other locations received additional armor as well. Instead of being from enchanted iron plates, the new armor is from high strength composites and alloys. This armor is actually stronger than the enchanted iron armor. 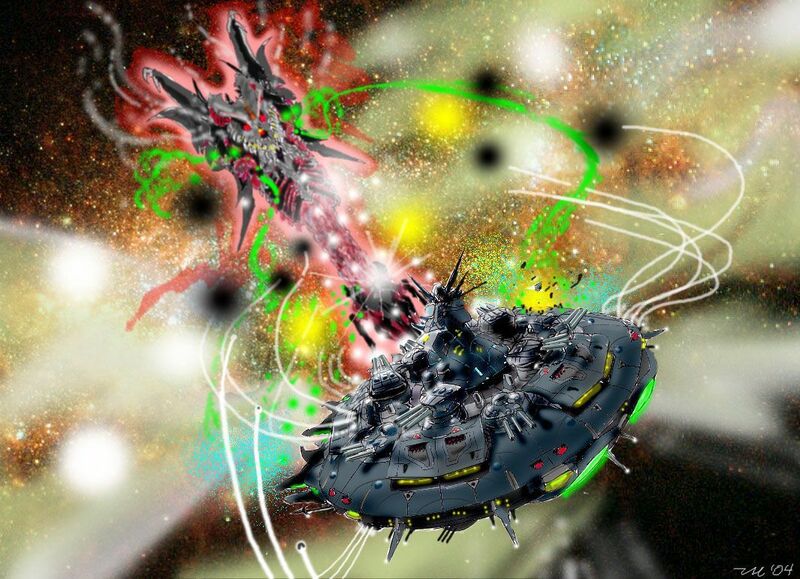 The normal weaponry carried on a system defense platform is retained including the Rifts Cannon and the twelve flame cannon turrets. Giving the platform a better long range missile firepower was one of the priorities of the engineers. The problem is solved by the addition of twenty cruise missile launchers. These launchers are similar to those carried in the Wolfen Hunter class destroyers and have been added to several other Warlock Naval vessel classes as well. Eight of the cruiser missile launchers fire forward while four fire to each side and four fire aft. Like with the Flame Cannons, the platform can be spun at high speed to fire massive volleys of cruise missiles. Software allows missile volleys to be linked and huge volleys of missiles to be fire. A small number of Bottled Demon cruise missiles are usually carried. The platform also has vastly increased point defense. Part of this is due to eight mini-death cloud cannon mounts. These are incredibly effective against missiles and can be used against larger targets as well. While the standard bottle demon launchers are retained, they have been refitted to fire normal mini-missiles for point defense. The remaining point defense weapons are also retained. Combined, the point defense systems are quite effective and they are supplemented by a shockwave defense system. The platform is simply too large to use standard techno-wizard modifications. Replacing fighters for the upgraded defense platforms is a priority and all upgraded platforms carry Katana fighters with faster than light boosters instead of the earlier Broadswords or Fire Eaters. This defense platform design uses modified starship speed and weapon range rules. See Revised Starship Rules for Phase World / Three Galaxies for more details. UW-SDP18 (FRAM1): Upgraded System Defense Platform. 2,420 (240 officers and 2,180 enlisted). 1,200 Marines (Typically 600 stay on board for platform defense), 800 fighter pilots, 6000 Warlock Combat Armor pilots, and can carry up to 500 passengers in addition. W-F1 Flying Warlock Combat Armors. WF-F15 Shadow Bolt Strike Ship. BIF-67 Katana Fighters with F.T.L. boosters. WF-P60S Black Widow II Heavy Starfighters. In reality this is how much damage needs to be done for a weapon to hit the bridge through the platform’s armor. This ship also has both an auxiliary bridge and a flag bridge. Even if all three bridges are taken out, the ship can still be piloted from engineering but ship is -3 to dodge and all weapon systems will be at local control. Weapon hits near the bridge that do not penetrate the ship’s integrity can injure crew members on or near the bridge. Depleting the M.D.C. of the main body will put the platform out of commission. All internal systems will shut down, including life support and internal gravity. The ship itself will be an unsalvageable floating wreck. Destroying the main engines reduces maximum sublight speed by half. This is not a variable force field, but a magical shield that must be completely depleted. Once the shield has been knocked down, it will cost 3000 P.P.E. require one minute (4 melee rounds) of spell casting to restore the force field. Magic, fire, lightning, and cold all inflict one-half damage. Water Surface: 30 knots (55.6 kph / 34.5 mph). Underwater: 10 knots (18.5 kph / 11.5 mph). Sublight: Has a special sublight engine that allows the platform to travel up to 60 percent of the speed of light. Space platform can accelerate/decelerate at the rate of 0.2 percent of light per melee. Atmospheric Propulsion: Maximum speed is 200 mph (321.9 kph), can enter an atmosphere and can leave but is not designed for atmospheric flight. Range: Life support will keep crew alive for up to ten years, as long as the P.P.E. generators are kept in working order. Height: 638 feet (194.5 meters). Width: 2620 feet (708.6 meters). Length: 3022 feet (921.1 meters). Mass/Weight: 44.8 million tons (40.64 million metric tons) fully loaded, plus up to 1.5 million tons (1.36 metric tons) of additional cargo. Power System: Combination Fusion & Techno-wizardry with 20 year life span. The System Defense Platform also has a P.P.E. generator that produces 12,000 P.P.E. per hour / 50 P.P.E. per melee. This P.P.E. can be used to power spells cast by the platform’s crew. Market Cost: The platform costs 225 billion credits to construct. The ship is not for sale outside the U.W.W. Armed Forces (The platform will not even be sold to U.W.W. member worlds.) Cost does not include embarked craft. Maximum Effective Range: 50,000 miles (80,000 km) in space and 50 miles (80 km) in an atmosphere. Mega-Damage: Roll on table in Dimension Book 2: Phase World page 156. Rate of Fire: Can fire once per minute (4 melee rounds/ 60 seconds). Payload: Requires 1,000 P.P.E. each time fired. Twelve (12) Triple Barrel Turrets with 16 Inch Flame Cannons (36 Cannons Total): While the cannons are virtually identical to those on the Dwarven Iron Ship, the heavy battery of flame cannons are mounted in triple turrets which can all engage a single target. The platform has a total of eight turrets on the top and twelve turrets on the bottom of the platform, Each top turret can rotate 270 degrees and has a 60 degree arc of fire upwards and 15 degree arc of fire downwards. Each bottom turret can rotate 270 degrees and has a 15 degree arc of fire upwards and 60 degree arc of fire downwards. All the cannons in a turret can be fires as one or each barrel can be fired separately. The ship can fire three turrets forward, two turret aft of the ship, and can fire four turrets to the side of the ship. The ship will often engage attacking with the sides to increase the ships firepower. Firing giant fireballs, these cannons have enormous range in space. With regards to fire control, these cannons are not designed to lock onto any targets smaller than frigates. While these cannons are able to be used to bombard planets as well as well, they have comparatively limited range in an atmosphere. Maximum Effective Range: 20,000 miles (32,200 km) in space and 20 miles (32.2 km) in an atmosphere. Mega Damage: 1D4x1000 M.D.C. each cannon and all three cannons in a turret can be combined for a total of 3D4x1000. Rate of Fire: Maximum of two (2) times per melee per cannon (A total of 72 individual blasts or 24 triple blasts). Payload: Each cannon needs 1000 P.P.E. per day to function. Eight (8) Magical “Mini Death Cloud” Cannons (Upgraded Platforms): These cannons are around the platforms with four on the top and four on the bottom of the platform. This weapon is very similar to that mounted on the Arcane patrol ship. The weapon release a massive amount of water that quickly freezes. While the ice is not a solid barrier, the particle density of the ice is great enough to eliminate missiles and inflict large amounts of damage to larger targets. Each weapon releases about 1/4 of the ice that the weapon mounted on the Arcane patrol ship does. The weapon can also be used to block heavy plasma weapons and can be used to hide a ship on sensors systems. The “wall” of ice has a virtually indefinite duration in space but does drift at the heading and speed of the ship launching the “wall” of ice. If used in an atmosphere, the weapon has only a momentary duration and reduced effects. The weapon system is useless underwater. The cloud of ice is -6 to dodge normally with the penalties for large ships used as well. Maximum Effective Range: Can be accurately targeted up to 1,000 miles (1,600 km) with a diameter of 25,000 feet (15,200 meters) when used in space and 10 miles (16 km) with a diameter of 250 feet (152 meters) when used in an atmosphere. Mega-Damage: A ship or missile 1D6 x speed of target in percentage of light. For example, a ship traveling at 10% of the speed of light would have 1D6x10 inflicted on them. Larger ships will have greater damage inflicted on them. Destroyer sized ships (greater than 1,000 tons but less than 40,000 tons) have damage multiplied by 5, light cruiser sized ships (greater than 40,000 tons but less than 100,000 tons) have damage multiplied by 10, heavy cruiser sized ships (Greater than 100,000 but less 1 million tons) have damage multiplied by 20, and the truly huge ships like heavy cargo ships and battleships (1 million tons and greater) have damage multiplied by 100. Most missiles are automatically destroyed by the cloud of ice. If used in an atmosphere, the weapon will automatically knock missiles off course and anyone flying through the cloud of water will need to make a piloting roll at -6 /-30%. Optional: The speed of the ship launching the cloud may also be calculated but it is math intensive due to the fact that direction of travel and vectors will also effect the damage of the weapon. Rate of Fire: Twice (2) per melee per mini-death cloud cannon. Payload: Each weapon may be activated 20 times per twenty four hour period. Further activations require 100 P.P.E. from either onboard magicians or drawing on the ship’s P.P.E. generator. Forty-Eight (48) Sub Particle Acceleration Cannons in Single Mounts: Mounted on top of the ship along the sides of the ship’s hull in individual mounts. Cannons mounts can fire at up to a 90 degree angle up or 55 degree angle down and can rotate up to 360 degrees side to side. The gun does not have penalties to strike small targets. Uses the spell of the same name from page 143 of World Book 16: Federation of Magic (although has far greater range.) The spells must be renewed every two months (costs 400 P.P.E. and 20,000 credits per cannon) but during that period the weapon can fire unlimited blasts. Mega Damage: 1D6x10+10 per cannon. Payload: Effective Unlimited, although the spells must be renewed every two months whether the cannons have been used or not. Forty-Eight (48) Twin Heavy Telekinetic Machine Guns Turrets: These heavy machine-guns are identical to those mounted in the Shadow Bolt Starfighter but are in twin mounts. Mounted on the sides of the platform in twin mounts. Heavy machine gun mounts can fire at up to a 90 degree angle up or down and can rotate up to 180 degrees side to side. The machine guns do not have penalties to strike small targets. Because the machine guns inflict damage by impact, they inflict full damage to targets that are using are using the spell “Impervious to Energy.” The spells must be renewed every two months (costs 400 P.P.E. and 20,000 credits per machine gun) but during the period the weapon can fire unlimited blasts. Payload: Effective Unlimited, although the spells must be renewed every two months whether the machine guns have been used or not. Twenty (20) Cruise Missile Launchers: The platform has been refitted with four missile tubes on either side of the ships rift cannon and four on the port, starboard, and aft side of the platform. This is to give the platform the ability to fire cruise missiles. The launchers are copied from those carried on a Hunter class destroyer. Missiles have a top speed of Mach 25 in an atmosphere and have an acceleration of 10% of light per turn (far faster than any starship) in space. Whether missiles can be shot down is calculated from the speed of target, launching starship, and missiles. When drive goes dead, missiles will continue to travel in a straight line unless set to self destruct or receives a destruct code, but have very low odds of hitting star ships (Great for hitting bases and planets because target does not move and missiles, when unpowered, are at -25% to be detected.) Cruise missiles have penalties to hit small targets but are almost always smart missiles. While missiles are only launched at the rate of one at a time, the ship’s computer has special software that allows all the missiles to hit a target at the same time for the purpose of making the point defense of a target more easily overwhelmed. This is done by slowing down the initial acceleration of missiles and by setting some for delayed activation although the target must be at least 30 seconds away (2 melee rounds) with regard to flight time. Missiles are then considered to only have an acceleration of 5% of light for the first turn. Batteries can launch on multiple targets each at the same time although rarely are. The launcher can also fire a special larger version of bottled demon missiles, although for safety purposes, only a few are normally carried on board. It has been said by many people that an escaped demon is worse than a matter/anti-matter explosion. They can be launched at the same rate as conventional cruise missiles, can use the same programming, and, although slightly smaller than a standard cruise missile, they are fitted into a collar that allows them to be used in the standard launchers. The missiles accelerate at the same rate as conventional cruise missiles. Missiles are considered super smart and have +4 to strike and +5 to dodge. Unlike normal missiles, the bottled demon missile does not explode and keeps striking at its target over and over. If the target is destroyed or vanishes, the missile disappears. The missiles are literally powerful demons summoned and bottled into a missile and are an aggressive and intelligent guidance system. The evil demons will continue to chase its target until destroyed (120 M.D.C. to the missile.) Optional: Because the super bottle demon missiles use a more powerful demon and the missiles are still experimental, there is a 5% chance that the missile will turn on the ship launching it. Rate of Fire: One cruise missile melee attack (special software allows 4 to 8 missile to be launched as one volley depending on gunners hand to hand attacks) per launcher. This allows total volleys of 80 to 160 cruise missiles to be launched in one melee round. Payload: Conventional Cruise Missiles: 50 cruise missiles per launcher for a total of 1,000 cruise missiles. Bottled Demon Missiles: 5 demon missiles per launcher for a total of 100 demon missiles. Eight (8) Bottled Demon Missile Batteries: On each side of the hull, the platform has four bottle demon missile batteries. The missiles are literally demons summoned and bottled into a missile and are an aggressive and intelligent guidance system. The evil demons will continue to chase its target until destroyed (50 M.D.C. to the missile.) Bottled demons are slightly larger than mini-missiles and require special launchers. Missiles have a top speed of Mach 10 in an atmosphere have an acceleration of 2% of light per turn in space. This is slightly faster than any starship except if it is exceeding it maximum safe acceleration. Missiles are considered super smart and have +4 to strike and +5 to dodge. Unlike normal missiles, the bottled demon missile does not explode and keeps striking at its target over and over. If the target is destroyed or vanishes, the missile disappears. The launchers have been modified so they can also fire standard mini-missiles even though the missiles are slightly smaller. This is done mainly by fitting the mini-missiles with a special sleeve that allows them to be fired from the launcher. This allows the launchers to be used for point defense and targets not worth a bottled demon. Mini-Missiles in the Phase World / Three Galaxies setting are normally smart missiles. Batteries can launch on multiple targets each at the same time. Maximum Effective Range: Bottled Demon Missiles: Effectively Unlimited! Once fired, the demon controlled and powered missile will fly and pursue the designated target until its target or the missile is destroyed (or the target vanished from sight, jumps away, or gets away by another means.) Conventional Mini-Missiles: Missile range is 2 miles (3.2 km) in an atmosphere and 100 miles (161 km) in space. Rate of Fire: Can fire missiles one at a time or in volleys of two (2), three (3), four (4), or eight (8) missiles per battery. Payload: Bottled Demon Missiles: 32 per battery for a total of 1,024 bottled demon missiles. Conventional Mini-Missiles: 64 per battery for a total of 2,048 mini-missiles. Magical “Shockwave” Defense System: When it is activated, a spherical energy wave is emanated from the ship in all directions which can devastate missile volleys. The blast is semi-spherical and the affects travel upwards and downwards as well. The blast does not effect targets underwater. It is a far longer ranged version of the eight level spell shockwave. Unfortunately, the spell can only be activated once per melee and requires magical energy every time it is activated. The system does not affect people and equipment on the deck of the ship. Maximum Effective Range: 40 miles (64.4 km) in space and 4,000 feet (1,220 meters) in an atmosphere in all directions. Mega Damage: 2D4x10 to all targets within radius of effect (S.D.C. objects will be completely destroyed). While the weapon system does not have the range to be generally effective against larger vessels because they will rarely get within the blast radius, larger ships will have greater damage inflicted on them. Destroyer sized ships (greater than 1,000 tons but less than 40,000 tons) have damage multiplied by 5, light cruiser sized ships (greater than 40,000 tons but less than 100,000 tons) have damage multiplied by 10, heavy cruiser sized ships (Greater than 100,000 but less 1 million tons) have damage multiplied by 20, and the truly huge ships like heavy cargo ships and battleships (1 million tons and greater) have damage multiplied by 100. The system also inflicts knock back as per the spell “Shockwave” on page 144 of World Book 16: Federation of Magic. In space, missiles hit by the shockwave will have a -6 to strike if not outright destroyed and small craft pilots have to make a piloting roll at -30%. Rate of Fire: Once per melee round. Payload: One, requires 35 P.P.E. to be activated again. Drawing by Talis D. Merrill (taalismn@pop.tiac.net). Copyright © 2004 & 2017, Kitsune. All rights reserved.